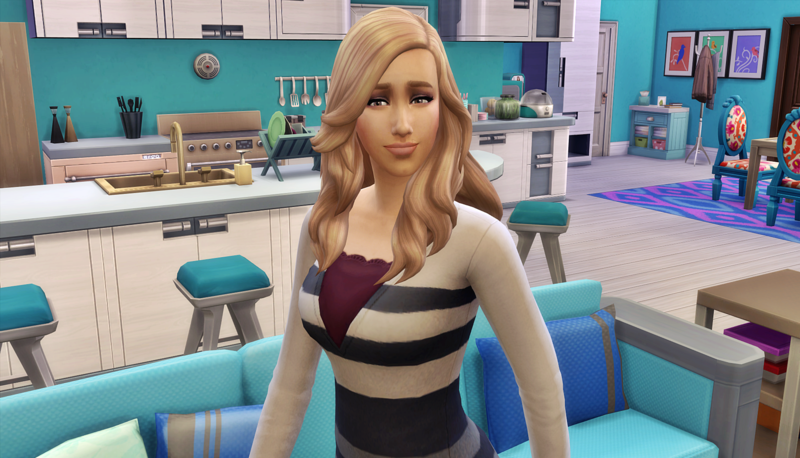 Aurora Vaughn, who went by Rory, looked around her new apartment. 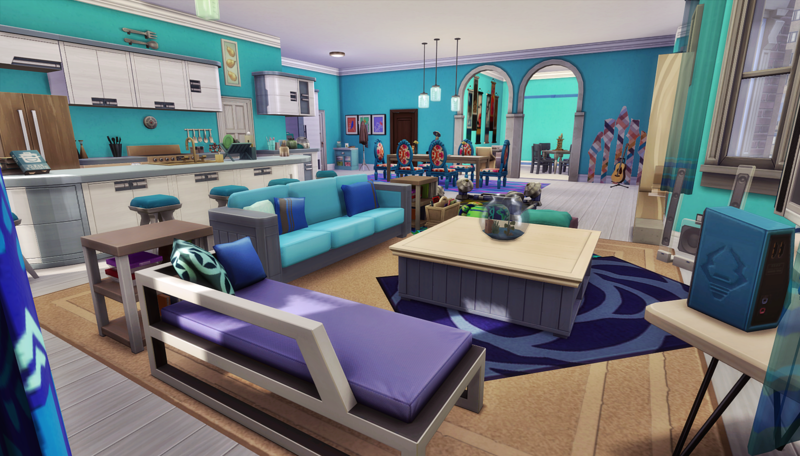 It was fully furnished and decorated, not something that Rory could afford alone as a nursing student, but thank goodness for trust funds. She’d put a small dent into the money set aside for her future, money she technically wasn’t supposed to touch yet, but she felt like it was worth it. Moving even farther away from her family to finish school, from Hamburg all the way to San Myshuno, wasn’t an easy decision. The Rosebrooks were a close-knit family, and her parents weren’t handling the separation well. Technically, Rory wasn’t a Rosebrook. Rory’s grandmother Mari was the last in Rory’s lineage to even bear the name Rosebrook, and that was before she got married. But still, when any of them referred to their whole clan, they tended to just call themselves the Rosebrooks. 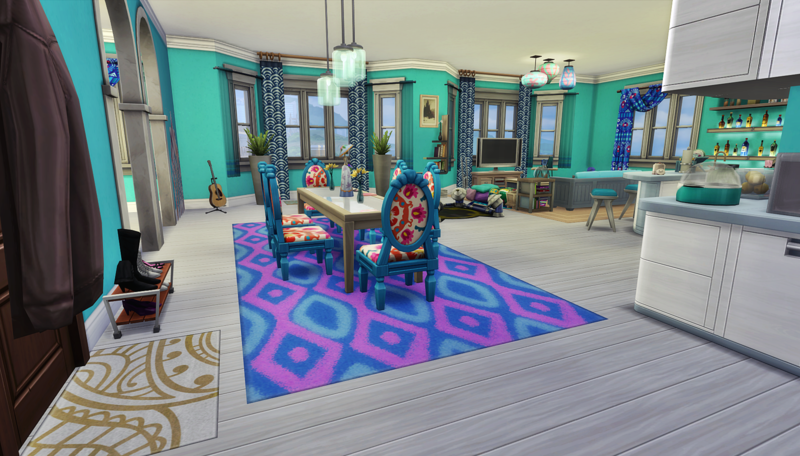 The apartment looked nothing like it did when she first picked it out. Walls had come down, the kitchen had been moved, and it was now a one bedroom. The only thing she kept was the parlor that worked so well as a game room. Rory felt that making a comfortable home for herself was essential. If she was going to make it in the city alone, and get through school successfully, she needed to feel good. It was the type of apartment one could grow into. 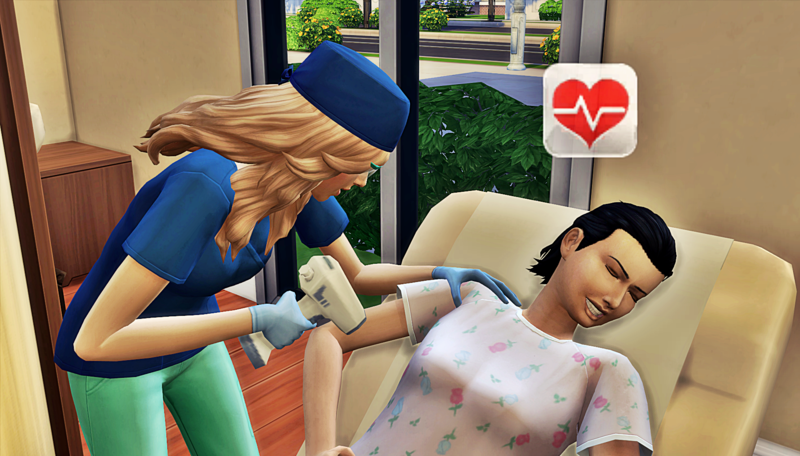 Rory certainly wanted to get married and have a family one day, but that needed to wait until she was at least done with nursing school. In the mean time, she would make friends, and maybe adopt a dog. At least she already knew she had two friends: Akira Kibo and Gavin Ralston. She met them because she signed up to be their potential surrogate on a whim. She wasn’t sad they hadn’t picked her to be the surrogate. She was grateful for the experience. She really connected with Akira, and she really connected with the area. Did you ever travel somewhere and within hours it just feels like home? That’s how Rory felt, and that’s why she ended up moving here. 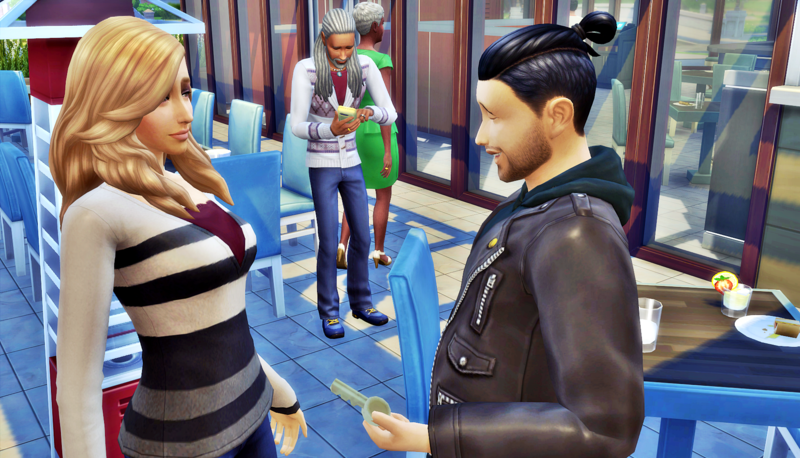 After moving in to the apartment, and registering for classes, the first thing Rory did was meet Akira out for coffee. “Of course I’m free! That will be so much fun,” said Rory. Rory liked her new school. It was very hands on. 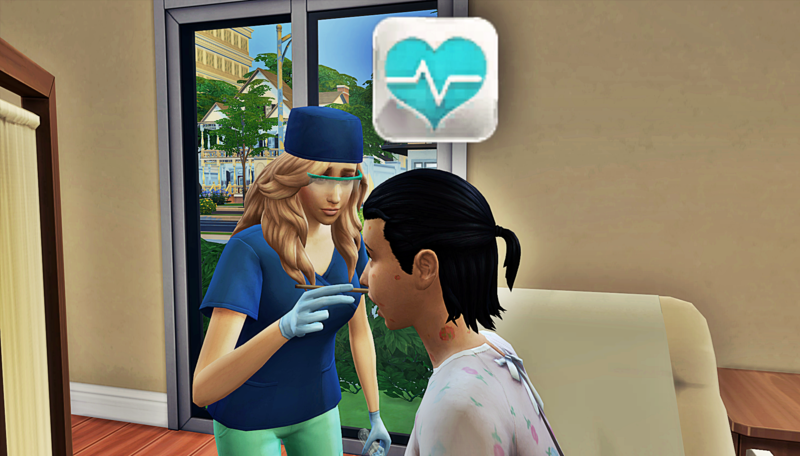 Her first day there, she got to see patients and try to help treat their ailments. 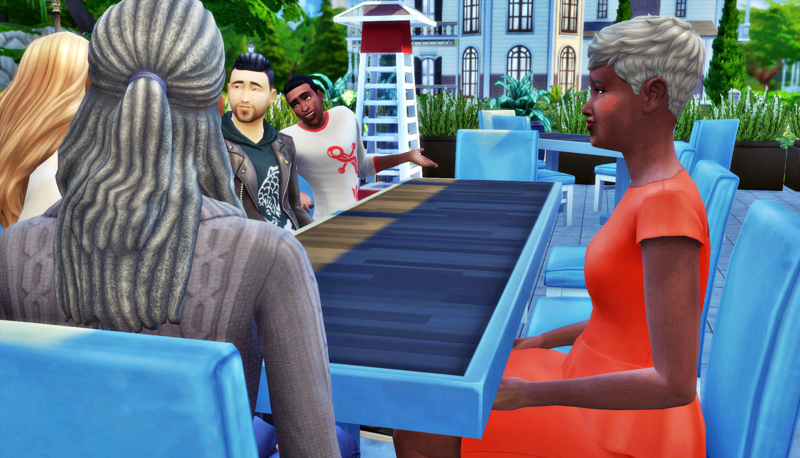 She was learning a lot, and that made her feel even better about making the move to San Myshuno. She still had a few things to learn though, like how to give a shot to a patient without causing them such great pain. By the end of the week, she was exhausted. But she got her second wind on Saturday morning when it was time for brunch. 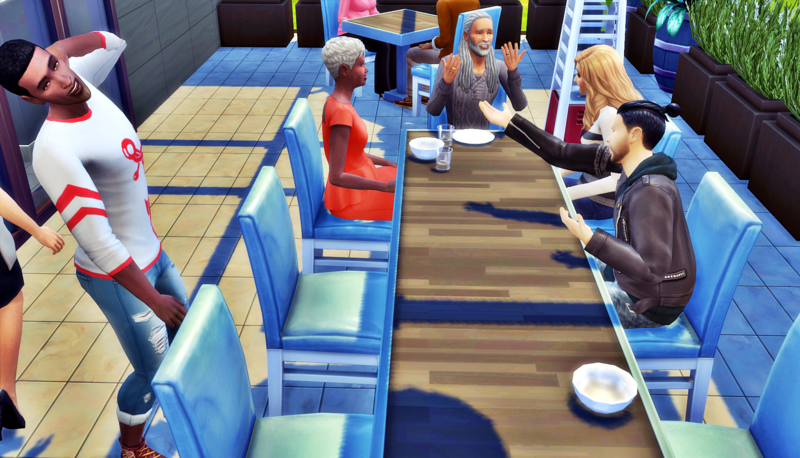 She met the Ralston-Kibo crew at a restaurant they frequented. It was kind of their go-to place for celebrating new beginnings. Much to Rory’s delight, they got a table outside. 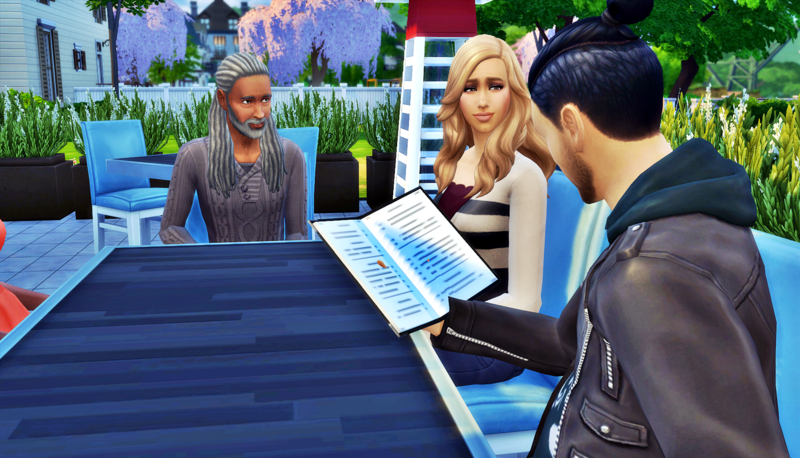 Rory was pretty good at Simlish, but it wasn’t long before she realized that her German accent, the Ralstons’ Caribbean accents, and Akira’s Japanese accent meant they’d all be repeating themselves a lot. She still had a lot of fun with them. She found Kenya and Cristian to be a charming couple. She wasn’t sure how that much charisma could fit into one household. She loved the way they’d embraced Akira as their own family, and it made Rory hopeful that she could find something similar for herself in her time there. She felt right at home with her new friends, and was really happy when Akira gave her a key to their apartment and told her she was welcome any time. She was grateful for the inclusion, and she was really curious to see what Akira’s and Gavin’s kids looked like. 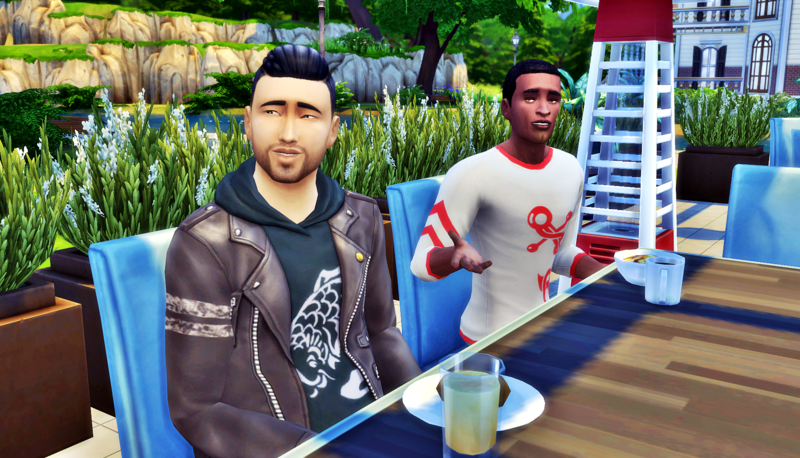 The highlight of the brunch had to be when Akira started serenading Gavin, and Gavin stood up to dance along! She figured she was in for some interesting times ahead, and she was really looking forward to calling home later to update her parents on her first week in a new life. Rory!!!!! Yeah, I’m hoping her life will be interesting, but not too heartbreaking. Fingers crossed she shows up a lot going forward. Rory is so adorable, and I’m so happy to have her in game. I’m hoping we’ll see a bunch more of her as she integrates into town. And I’m really excited to see who the game marries her off to. At this point, all my pre-mades are still around, but they’re all married off. Some of them have kids who are in the right age range. 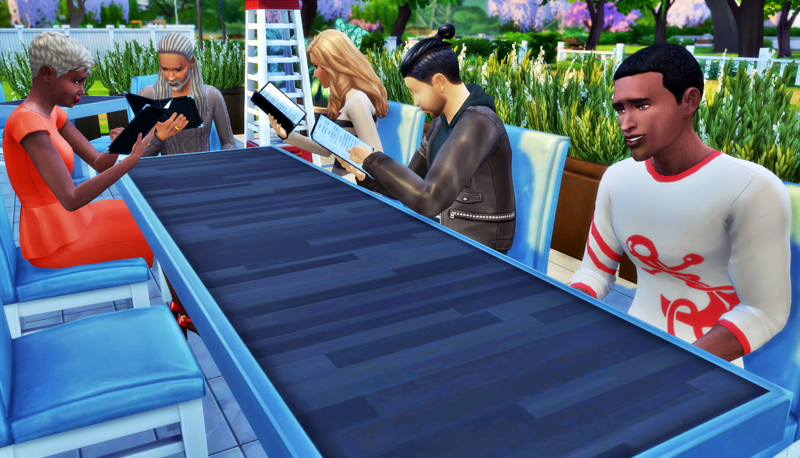 As you know, there are lots of lovely townies in my game too. So we shall see. 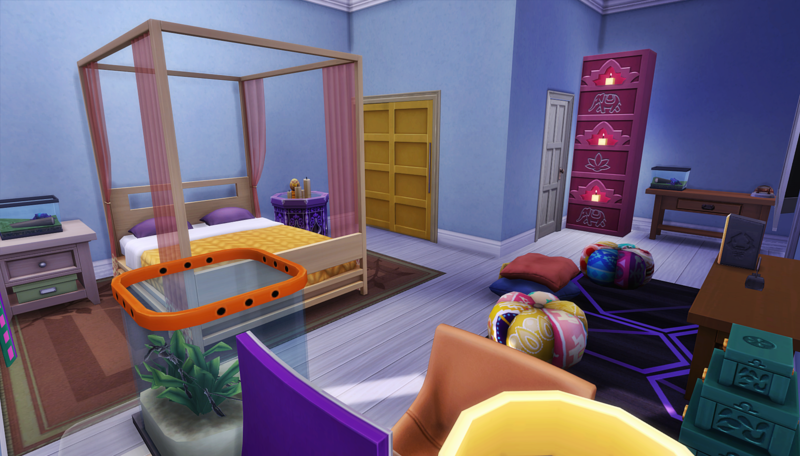 Fingers crossed the game let’s her finish “school” before she settles down, haha. Akira and Gavin are both bisexual. I think Akira would be a firm 3 on the Kinsey scale, Gavin more like a 4 or 5. And Rory is beautiful. But hopefully, there won’t be any issues! I give my Sims free reign for things like that, but I’ve got my fingers crossed that doesn’t become part of the story drama. A point of hope: when I’m playing Akira, and I click Rory, the default options available never include Flirt or Pick-Up Line so far. They’re always Brighten Day and Ask about Day, stuff like that. So far, it’s been just a true friendship. Sure! Gavin would be heartbroken! He really would. I’m counting on Akira’s love *cough*obsession*cough* with Gavin to keep their relationship safe. I had another thought after I clicked send, lol. Things like this is why I love that most of my story is game-driven. 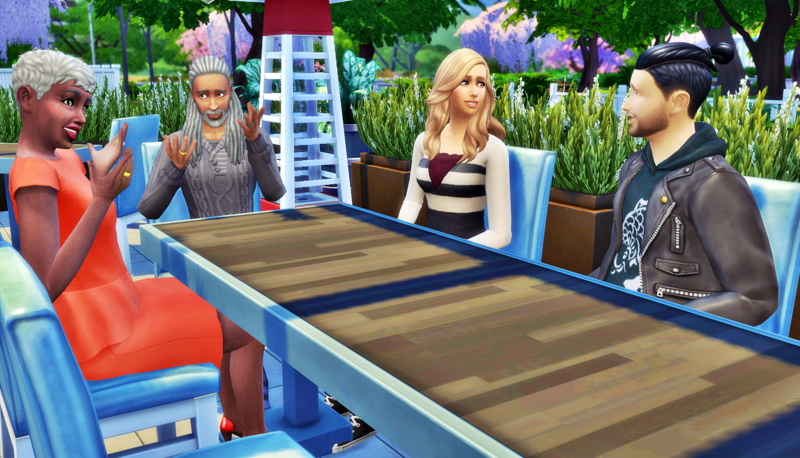 Because so far it seems like there’s no drama or concern there, but these Sims are gonna live a loong time, lol.